Find keywords concept. Marketing specialist looking for keywords (concept with magnifying glass). Page Title: The page title, also known as a title tag or title element, is written in the coding of the page, like this – <title>Mention Your Keywords Here</title>. The page title isn’t displayed on the page itself, but is shown in the search results and in the web browser. You definitely need to add your the keyword for a page here, but don’t just put the keyword and nothing else. At the very least, put your business’s name either before or after the keyword. Url: The web address for the page (i.e. www.yoursite.co.uk/mention-your-keywords-here). This is a good place to add keywords as you can use them without needing to use them in a catchy or enticing way like with the page title or H1 tag. 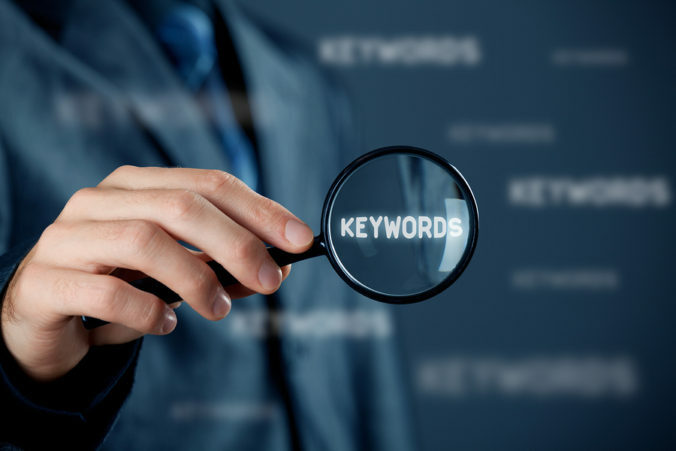 Using keywords in your url isn’t possible when trying to rank your homepage though. H1 Tag: The main header tag for the page. This is normally the title at the top of a page that tells the reader what the page is about – like an article title in a magazine or newspaper. This should ideally grab the interest of visitors to your site, to make them want to read on, so you need to balance using your keyword with making it interesting. Body Content: The main written text on a page, such as a product/service description or an article. You only need to mention the keyword once, though you can mention it more times if that happens naturally when you’re writing. You definitely don’t need to aim for any kind of keyword density (2%, 5%, etc.). Site Navigation Link Text: The text that forms the links in your top navigation bar or sidebar. Using your target keyword in its exact form here can look spammy, and can negatively affect the user experience, so normally you’ll have to use a shortened or alternate version of it. In-Content Link Text: The text that forms the links on your pages that link to other pages on your site (e.g. this links to a page on this site about SEO for internal links). Mix up your usage, by sometimes linking up the exact keyword and sometimes linking up a partial sentence that the keyword is in. Always keep the user experience in mind with this. Image Tag: The html code used to add an image to the page (i.e. <img src=”file-name-including-keyword.jpg” title=”Title of the image including the keyword” alt=”Description of the image including the keyword”>). This text won’t show up on a page, unless, for some reason, the image itself doesn’t load. If there are multiple images on a page, you can add variations of the keyword to each of them. Meta Description: The snippet of text that gets displayed in the search results to describe the content of the page. Search engines don’t use this as part of their ranking algothrim, however, they do highlight/bold any keywords used here, which makes your site stand out more in the search results and seem more relevant. Google no longer takes into account the meta keywords tag (i.e. <meta name=”keywords” content=”Keyword 1, Variation of Keyword 1″>), as it’s too easy to manipulate and spam. As they don’t pay attention to the tag, it makes no difference at all to your site’s rankings if you use it or not. Some sites still use it, some don’t. If anything, you’re better to not use it, as doing so makes it easier for competitors to pinpoint what exactly keywords you’re targeting.